Mets outfielder Yoenis Cespedes provided an update on his efforts to return from surgeries to both heels. As Deesha Thosar of the New York Daily News writes, Cespedes expressed confidence that he will be able to make it back to the MLB field, but says it’s unlikely to occur before the middle of the coming season. Cespedes does say that he’s now pain-free, which seems promising, though it remains to be seen how things will progress once his rehab is able to ramp up toward full speed. In other recent Mets news, ace Jacob deGrom discussed his contract situation with reporters including Tim Healey of Newsday. Generally, deGrom reiterated what is already known to be the case: he expects to discuss an extension in the coming weeks but has yet to receive an offer and won’t negotiate past the start of the season. The star righty largely demurred when asked about the oft-floated concept that he might operate under self-imposed workload limitations if he doesn’t have a long-term deal, though he did not rule out such an approach. Speaking of possible blockbuster extensions, Rockies star third baseman Nolan Arenado will not follow deGrom’s lead in placing timing restrictions on his talks with the club, as MLB.com’s Thomas Harding reports. Arenado said he does expect there to be a “silent deadline” once “serious games start,” though generally it sounds as if he’s open to chat just about any time. It certainly seems as if there are plenty of good vibes between player and team, though hammering out an appropriate contract will still come with challenges. Arenado, 27, already agreed to a record-setting $26MM salary for the 2019 campaign, after which he’ll hit the open market. Nationals reliever Aaron Barrett has been through a gauntlet of terrible arm injuries, but he’s still plugging away at a comeback effort. As Mark Zuckerman of MASNsports.com writes, the 31-year-old righty is showing some signs of real potential while enjoying an opportunity to pitch in MLB camp, though he has a ways to go before he’ll truly be considered for a big league opportunity. Barrett once featured intriguing swing-and-miss stuff, but has made only twenty low-A appearances over the past three seasons. The Mets haven’t been connected to outfielder Bryce Harper or infielder Manny Machado – the best free agents available this offseason – in part because, “I don’t know how many teams have two $30-million players,” COO Jeff Wilpon said this week (via Tim Healey of Newsday). Wilpon was alluding to the Mets’ highest-paid player, outfielder Yoenis Cespedes, who will make just shy of $30MM per year over the next two seasons. But Cespedes is not under contract thereafter, may not even play in 2019 because of heel problems, and will have insurance cover some portion of his money while he’s on the shelf. Still, whether the outfield’s a pressing need for the Mets is debatable, as they have Brandon Nimmo, Michael Conforto, Juan Lagares and Keon Broxton headlining that group. Wilpon noted the Mets “have some pretty good lefty outfielders” in Nimmo and Conforto, lessening the need for Harper. Entering the offseason, they weren’t as fortunate on the left side of their infield, where Machado could have made a huge difference. The team has since signed Jed Lowrie, though, and it’s seemingly content to go forward with him as its primary third baseman and Amed Rosario at shortstop. However, even after reeling in Lowrie (and acquiring other pricey veterans in Robinson Cano, Wilson Ramos, Jeurys Familia and Justin Wilson), the Mets are still roughly $40MM under the luxury tax, Healey points out. Nevertheless, the big-market club is apparently content to stay out of the sweepstakes for both Harper and Machado. Although the Rockies’ Bud Black is entering a contract year, the manager’s not fazed by his uncertain status beyond 2019. “Those thing work themselves out,” said Black (via Nick Groke of The Athletic). If Black wants to stay with the Rockies, it’ll be a surprise if they don’t extend him this offseason or sometime prior to next winter, as he’s easily their most successful manager ever in terms of winning percentage (.548). The Rockies have made the playoffs in each of the well-regarded Black’s two seasons on the job and gone 178-147. Dodgers closer Kenley Jansen, who underwent surgery in November to address an irregular heartbeat, told J.P. Hoornstra of the Southern California News Group and other reporters Saturday that he’s back at full strength. Pitching in the thin air of Colorado has been particularly problematic in recent years for Jansen, who was hospitalized after a game there last August, but trips to Coors Field won’t be an issue for him going forward. “If I’m hydrated I should be fine,” Jansen said. Earlier this offseason, John Farrell interviewed for the Reds’ managerial position – a job that ultimately went to David Bell. While Farrell was among many runners-up in that derby, he’ll still work with the Reds in 2019, Mark Sheldon of MLB.com reports. After serving as a scout and advisor last year, his first in Cincinnati, he’ll function as a pitching consultant during the upcoming season. Farrell, 56, is best known for his run as Boston’s manager from 2013-17, during which the team went 432-378, took home three division titles and won a World Series championship (’13). Bryce Harper and agent Scott Boras had a five-hour meeting with Nationals owner Ted Lerner on December 22, Chelsea Janes of the Washington Post reports. Sources from within the team declined to confirm that such a meeting took place, which Janes describes as “a departure from their relative openness about their status with Harper this winter.” One possibility is that Lerner held the meeting without informing anyone else in the organization, which Janes notes “has happened before,” though it could be that the front office is keeping quiet on details either as a gamesmanship tactic (to drive up Harper’s price for other teams), or because an ardent pursuit of the free agent outfielder is underway. This is the latest twist in the perhaps-ongoing courtship between Harper and the Nats, as ESPN.com’s Jeff Passan reported earlier today that Harper had had “multiple” meetings with team representatives. Boras and Lerner have a longstanding professional relationship that has resulted in several high-profile Boras Corporation clients (i.e. Stephen Strasburg, Max Scherzer) sign extensions or free agent deals with Washington. Boras has also often bypassed general managers to negotiate directly with ownership in some particularly major contracts, and he has signaled this intent in regards to Harper’s market this offseason. There had already been some indication that the Mets weren’t expecting Yoenis Cespedes to play in 2019 as the outfielder recovers from a pair of heel surgeries, and special assistant Omar Minaya reiterated as much in an interview on MLB Network Radio on SiriusXM (hat tip to MLB.com’s Anthony DiComo). “If [Cespedes] gives us anything this year, that is great, we’re happy for that,” Minaya said. Cespedes’ first procedure in late July carried a rough timeline of eight-to-ten months before a return to baseball activities, and no update to that timetable was made after Cespedes underwent his second surgery in late October. Cespedes has long been plagued by a variety of lower-body injuries, and since signing a four-year, $110MM deal with the Mets prior to the 2017 season, the outfielder has played in just 119 games. As it stands, New York’s starting outfield consists of Michael Conforto and Brandon Nimmo in the corners, Juan Lagares in center field, and the newly-acquired Rajai Davis as the fourth outfielder. The Mets have been linked to other outfielders on the rumor mill, however, so it is quite possible more changes could come before Opening Day. The Orioles have hired Koby Perez as the team’s new Senior Director of international scouting, as per a team press release. The 40-year-old Perez spent the last three seasons as the Indians’ director of Latin American scouting, his most recent stop in a career that has spanned 12 seasons and included roles as a crosschecker and scout with Cleveland, Philadelphia, and St. Louis (Perez and Orioles GM Mike Elias both worked as scouts in the Cardinals’ organization for two years). Under his new title, as per the press release, “Perez will oversee all aspects of the Orioles’ international scouting operations and management of the club’s bonus pool.” The Orioles have been notoriously indifferent to the international market for years, though this focus began to change even prior to Elias’ hiring, as Baltimore made a strong attempt to sign both the Mesa brothers and Sandy Gaston this fall. Going forward, it certainly seems as if the O’s will now be as aggressive and thorough in locating and signing international prospects as any club in the sport. The Yankees’ signing of Troy Tulowitzki doesn’t mean the team is out on Manny Machado by any means, Joel Sherman of the New York Post opines as part of a seven-tweet thread (all linked here). That said, the Yankees wouldn’t publicize being out of the Machado sweepstakes anyway, as such a statement would violate Collective Bargaining Agreement rules about teams weighing in on free agents. It also makes strategic sense for the Yankees to at least appear to still be in on Machado, if for no other reason than to force rival teams to spend more to sign him. If Machado indeed doesn’t land in New York, Sherman feels the Yankees could address their infield needs by signing a player like Neil Walker or Adeiny Hechavarria to provide short-term help until Didi Gregorius is able to return. Sherman suggests that infield help could also be found as part of a Sonny Gray trade package. Earlier this afternoon, the Mets sent shockwaves through the baseball world by reportedly agreeing to terms with former CAA agent Brodie Van Wagenen on a deal to become the team’s new General Manager. The hire, reportedly spearheaded by team COO Jeff Wilpon, is a puzzling one for an organization in flux: Van Wagenen, after all, was hired despite a résumé utterly devoid of any front office, scouting, or player development experience, and currently represents nearly a quarter of the Mets’ 25-man roster in contract matters. Charges of interest conflicts will assuredly be flung from all directions – according to Joel Sherman of the New York Post, the club seems as throughly entangled with the 44-year-old former agent as any in the league. In the past two offseasons alone, Van Wagenen has negotiated deals on behalf of outfielder Yoenis Cespedes, third baseman Todd Frazier, and lefty Jason Vargas for a combined $143MM. Of particular interest to Sherman is Van Wagenen’s February 2018 outburst, where the agent, furious at perceived collusion in the glacially-paced free agent market, drafted a public statement suggesting that some frozen-out players may have been preparing to boycott the upcoming season. Van Wagenen, of course, has now scooted his seat to the other side of the table, where the traits he doubtless extolled so forcefully will likely be minimized at every turn. The elephant in that room, it seems, is 30-year-old Jacob deGrom, on whose side Van Wagenen has long campaigned for either an extension or trade, and many questions await. Van Wagenen and his new colleagues could certainly extricate themselves from the awkward discussions to follow by peddling the ace at first opportunity in the forthcoming market, but that route seems altogether unlikely at this point. In a separate report by The Post, sources indicate that team owner Fred Wilpon is hell-bent on a playoff run next season and was loath to consider candidates who suggested otherwise. In other rumblings from Flushing . . .
Kristie Ackert of the New York Daily News raises similar questions of the new hire, posing scores of inquiries about current and prospective players and the potential conflicts of interests with both. In particular, she addresses the cases of former Van Wagenen clients Cespedes and Vargas, both of whom the agent may be forced to engage in uncomfortable discussions with. Cespedes, of course, underwent a second surgery on his left heel yesterday and may miss up to half of the upcoming campaign. Though he’s been productive at the plate over the last two seasons, slashing .282/.343/.525, the 33-year-old has been limited to just 120 games over that time and will figure to miss a good deal more in the season to come. Vargas, 35, had a dreadful season last year, allowing 1.76 HR/9 and posting just 92 IP across 20 starts on the way to a 5.77 ERA. His 8.22 K/9, the highest of his career, did leave some room for optimism, but a return to a similar path will almost surely leave the new GM in an extremely awkward position with a former client who has just one year remaining on his deal. Mike Puma of the New York Post reports that Matt Ricatto and Jeff Berry of CAA will now handle agency duties for deGrom following the departure of Van Wagenen. Mets outfielder Yoenis Cespedes has undergone surgery on his left heel, the club announced. This was the second of two procedures to address bone calcification in both feet. The club has not released any further information about the outcome. Assuming everything went according to plan, the hope is that Cespedes will be cleared to start baseball activities in approximately four months. He will begin running again at a later point in time. Surgeons waited approximately three months between the first procedure, to the right heel, and the surgery that was just announced. That approach avoided a lengthy and potentially problematic stretch of bed rest. All indications are that Cespedes remains more or less on the timetable that the New York organization gave in late July. It was stated at that time that he’d be sidelined for a minimum of eight to ten months. Of course, being fully prepared for MLB game action could be a bit further off than that, since Cespedes will need to get into playing shape and shake off the rust. 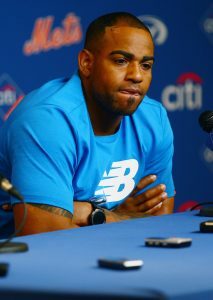 From this point, the Mets have little choice but to hope that Cespedes responds well to rehab. The 33-year-old may conceivably be available for a reasonable portion of the 2019 season, though he’ll almost surely miss a fairly significant portion of time even under the most optimistic outlook. Cespedes is owed $58.5MM over the following two seasons and has full no-trade protection. With Yoenis Cespedes set to miss some portion of next season as he recovers from two heel surgeries, Mets COO Jeff Wilpon admitted on Sunday that the team will have to plan as if he won’t play in 2019 (via Tim Healey of Newsday). “You probably do have to plan that way, given the fact that it’s uncertain,” Wilpon said of Cespedes, who will enter the penultimate season of a four-year, $110MM contract in 2019. Fortunately for the Mets, it appears they have at least two starting-caliber corner outfielders on hand in 2018 breakout star Brandon Nimmo and Michael Conforto, and their presences should make Cespedes’ absence less noticeable for however much time he misses next year. The re-signing of Cespedes in 2016 has been the Mets’ biggest free-agent splash in recent years, but Wilpon suggested that hasn’t been because of an unwillingness to spend on the team’s part; rather, it was outgoing general manager Sandy Alderson recommendation that the club avoid high-priced free agents, Mike Puma of the New York Post reports. Mets fans don’t seem to buy it, though, as the responses to Puma’s tweet indicate. Yankees catcher Gary Sanchez has come under fire for his difficulty with blocking pitches – he was the majors’ third-worst catcher in that department during the regular season, according to Baseball Prospectus – but general manager Brian Cashman isn’t overly concerned about that aspect of his game. “Believe it or not, that falls down (the list) compared to the other things he brings to the table, including his bat,” Cashman told NJ.com’s Brendan Kuty, who goes into detail about Sanchez’s subpar regular season. After establishing himself as an elite offensive catcher from 2016-17, his first two seasons, Sanchez fell flat during an injury-shortened year with a .186/.291/.406 line in 374 plate appearances. The 25-year-old continued to provide considerable power, though, evidenced by his 18 home runs and .220 isolated slugging mark, and may have deserved better production in general. Not only did Sanchez post a .220 batting average on balls in play, down from .308 over the previous two years, but he logged a .357 expected weighted on-base average – up 53 points from his .304 wOBA (per Statcast). And for all the handwringing over his defense, Sanchez actually earned a positive overall mark from BP. Speaking with reporters on Sunday, Mets COO Jeff Wilpon revealed that he and assistant general manager John Ricco will lead the initial round of interviews to find the team’s next GM (via Mike Puma of the New York Post). While the job still technically belongs to Sandy Alderson, it seems the leave of absence he took in June to battle cancer essentially ended his reign atop the team’s baseball department. Indeed, the Mets have known since June that they’d need a new GM, Tim Healey of Newsday was among those to tweet. None of Ricco or fellow assistants Omar Minaya and J.P. Ricciardi are candidates to succeed Alderson, Wilpon said (via Puma), though he hopes those three return. Whether that happens will be up to the team’s next baseball chief, however. It’s possible the Mets’ coaching staff will also see changes heading into next season. First-year manager Mickey Callaway said he expects his whole staff to return in 2019 (per Healey), but he may not be even be safe. Callaway’s fate “will depend on the new GM’s thoughts,” Wagner tweets. Wilpon did praise Callaway & Co. on Sunday, saying (via Healey): “Mickey and the staff did a nice job not letting anybody quit and keeping them moving forward, which was certainly something that could have happened. We saw it with other teams in our division, where they had a great first half and fell apart.” While crediting his own team’s coaches, Wilpon jabbed at the NL East rival Phillies, who collapsed in the second half of the season. Mets outfielder Yoenis Cespedes will undergo the second of two scheduled heel surgeries on Oct. 23, Tim Britton of The Athletic was among those to tweet. Cespedes expects to resume baseball activities roughly four months later, but he still won’t be able to run, Britton adds. The soon-to-be 33-year-old underwent his first heel surgery in late July, which ended his season and could keep him out for a sizable portion of 2019. Meanwhile, one of Cespedes’ teammates – infielder Jose Reyes – told reporters that Sunday’s game will be his last with the Mets, Wagner relays. The 35-year-old Reyes, a Met from 2003-11 and again since 2016, has managed a meager .583 OPS in 250 plate appearances this season. Reyes hasn’t decided on whether he’ll try to play again in 2019, but considering his output this year, he may not generate any interest as a free agent. The Mets have announced that star outfielder Yoenis Cespedes will undergo season-ending surgery. He had already been placed on the disabled list yesterday due to calcification in both heels. It is expected that Cespedes will require at least eight to ten months of rehabilitation before he’ll be able to return, assistant GM John Ricco said at today’s press conference (via Mike Puma of the New York Post, on Twitter). That period could end up being extended, depending upon how the veteran responds to treatment. Needless to say, this is not the news the Mets hoped for in the midst of an already disastrous season. The 32-year-old Cespedes is owed $58.5MM over the next two campaigns. There is a silver lining here, in that Ricco says the club will have an opportunity to attempt to recover some of the funds through an insurance policy (also via a Puma tweet). Given the recovery timeline presented, and building in a period to get up to baseball speed, Cespedes will likely not be able to return until the middle of the 2019 season at the earliest. While it’s possible the Mets will end up receiving a significant contribution from him next year, the organization will likely enter the offseason operating under the assumption that they need to make alternative plans. While the news is unfortunate, it also presents questions for all involved. Cespedes had been out for two months with a hip injury — his most recent in a string of maladies involving lower-body muscles. It was not until he had worked back to the majors, though, that the heel issue was identified as an underlying cause. (And, even then, it seemed that the team was not fully aware of the new diagnosis.) The timing of all these developments is certainly suboptimal given that the procedure requires such a lengthy rehab stint. Sorting out the medical situation remains a long-term priority, though perhaps that will wait until the team makes some decisions on baseball operations leadership over the offseason. In the near-term, it’s still not entirely clear what direction the Mets will take at the trade deadline. Ricco says the news on Cespedes won’t really change the outlook, but it certainly could weigh in the balance if the organization decides to consider moving some of its top pitching assets next winter. Cespedes, 32, has appeared in 38 games for the Mets this season and batted .262/.325/.496 with nine home runs and six doubles. He landed on the disabled list in mid-May with what was, at the time, termed a “mild” strain of his right hip flexor but ultimately wound up missing more than two months with the injury. Cespedes returned last ween and homered in a two-hit showing, but he’s been out of the lineup since. Over the weekend, Cespedes’ heels became yet another circus-like storyline for the Mets, as the outfielder told reporters that he could require surgery to repair the issue — only for manager Mickey Callaway to eventually express concern to the media and say that he was unsure of what Cespedes had said. Callaway later backtracked (link via the Post’s Dan Martin) and said that he “misspoke” and handled the situation poorly. Assistant GM John Ricco, part of the Mets’ acting-GM triumvirate, acknowledged over the weekend that Friday was the first the team had heard he was considering surgery (Twitter link via James Wagner of the New York Times). Cespedes would be the second Mets outfielder to require season-ending surgery, joining Juan Lagares (toe) in that regard. With him on the shelf, be it for a shorter term or for the remainder of the season, the Mets will continue to utilize Brandon Nimmo and Michael Conforto in the outfield. Matt den Dekker is currently getting some time in the outfield as well, though Jay Bruce figures to eventually return from hip discomfort to claim some playing time. A right adductor strain had kept Justin Turner out of the Dodgers’ starting lineup since July 11, though his return to his regular third base spot today didn’t last long. Turner had to leave today’s 11-2 win over the Brewers in the middle of the third inning due to right groin tightness. Talking to media (including the Orange County Register’s Bill Plunkett) after the game, Turner said that his injury “definitely didn’t get worse but wasn’t as good as I’d hoped.” A DL stint could potentially be in the cards, though Turner will first receive further examination from the team’s medical staff. Turner already missed the first six weeks of the season due to a fractured wrist, and it’s fair to say that his performance has suffered due to these injuries. He is still delivering above-average (110 wRC+) production, though his .259/.354/.398 slash line is below his usual standards, particularly in the power department. If he does hit the DL, Los Angeles likely already has enough infield depth that they wouldn’t look for any more help at the deadline, especially since the Dodgers already made a big infield addition in Manny Machado. It might be interesting to monitor if Machado gets any time at the hot corner if Turner if out, though it’s more likely that Machado will simply remain at shortstop. That same Dodgers/Brewers game also saw Milwaukee southpaw Brent Suter leave after three innings due to a forearm strain. Manager Craig Counsell told the Milwaukee Journal Sentinel’s Tom Haudricourt and other reporters that Suter would undergo an MRI, though Suter is expected to land on the disabled list. Suter had a brief DL stint earlier this month with tightness in that same forearm, so it isn’t surprising that the team would be cautious with such an injury even if the MRI doesn’t reveal anything serious. Milwaukee was already rumored to be looking for pitching at the deadline, and that search is likely to intensify with Suter out of action. Suter was rocked for six runs today to boost his season ERA to 4.80, though Suter has just a 1.64 BB/9 to go along with a 7.46 K/9 rate, and ERA predictors (such as a 4.04 xFIP) are generally more favorable about his performance. Yoenis Cespedes’ recent comments about considering surgery to fix calcification in his heels caught the Mets by surprise, assistant GM John Ricco told the New York Times’ James Wagner (Twitter links) and other reporters. Still, Ricco stressed that surgery would be Cespedes’ “last resort” to solve his ongoing leg problems, and that Cespedes’ comments could have been made out of simple frustration. The outfielder will visit doctors tomorrow, though Ricco said that an examination of Cespedes’ feet in June indicated that the injury could be managed without immediate need for surgery. Yankees outfielder Clint Frazier was placed on the seven-day concussion DL this weekend while playing at Triple-A, though his status has been changed to a 10-day stint on the Major League disabled list. (NJ.com’s Brendan Kuty was among those who had the news.) Beyond the specifics of his placement, Frazier’s injury could also impact his immediate future in the organization, as the prospect has often been cited as a popular trade chip for the Yankees at the deadline.